Busan is the second largest city in South Korea. 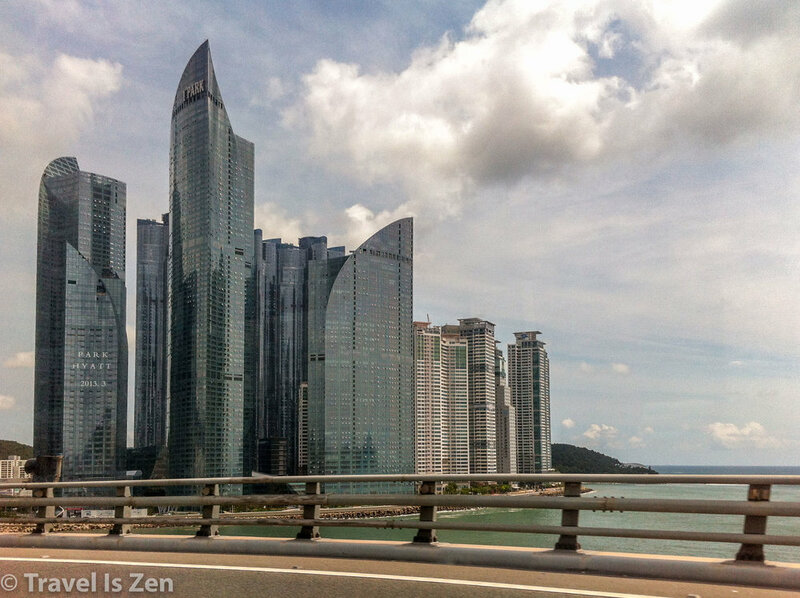 From Seoul, a high-speed train criss-crossing the country to Busan in the southeast takes only 2.5 hours. Yes, you could be building sandcastles and dipping your toes in the East Sea by lunch time! Compared to the hustle and bustle of Seoul, Busan is laid back (like a beach town should be! ), with lots of laughter and friendly faces. The public transportation system in Busan is excellent, with subway stops near all major beaches. Travel sites and blogs touting the best beaches in Busan always start with Haeundae Beach. This makes me believe they have never been there (or it’s the only beach they visited). This 1.5 km U-shaped strip of sand and park area sits at the foot of Busan’s city center. It is one of the world’s most crowded beaches. Go there for the sheer awe of seeing thousands of brightly colored umbrellas literally covering the sand and gazillions of fully-dressed Koreans bobbing in the waves on yellow inner tubes. It’s a sight! But it’s not a nice place for a relaxing day at the beach. Gwangalli Beach is another top mention. It’s smaller and slightly less crowded than Haeundae Beach and has a separate area for boogie boarding and surfing. 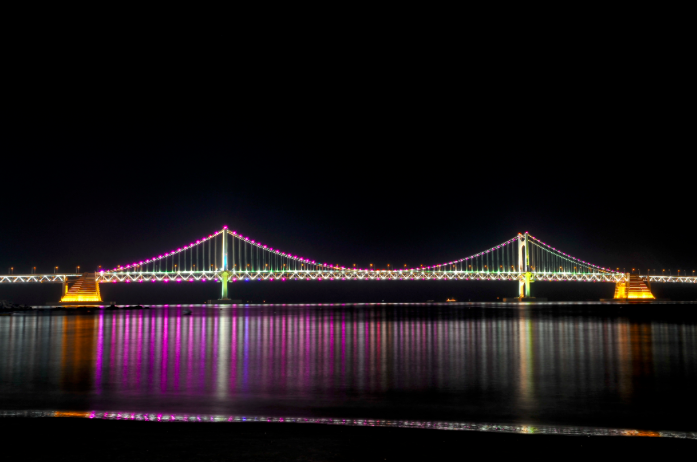 I suggest going there in the evening, though, since it’s primary claim to fame is as a perfect spot to view the nightly Diamond Bridge (Gwangandaegyo) light show. Another popular tourist beach is Songdo Beach. There is a lot going on here, with skywalks jutting out to sea, a cable car, colorful wave breakers and interesting sculptures both in and out of the water. There’s even a tortoise-shaped diving platform. Busy, busy, busy. This is a fun beach to explore, with terrific views of the city and bay area. It’s also close to Amnam Park, where you can amble cliffside through the pine trees. But relaxing? No. If you actually want to enjoy the beach — the sunshine, water, powdery sand, quiet waves and unobstructed sea views — then head to Dadaepo Beach, where the locals go. This beach is way off the beaten path in Busan, but the 40 minute subway or bus ride is worth it. Especially at low tide, the sand extends forever! There is a boardwalk winding through a small pine grove and a short cliff walk for terrific views of the entire beach. This beach faces the south, so it’s a great spot for both sunrises and sunsets. Local’s Choice for #1 Beach in Busan: Dadaepo! By Bus From Busan Station: Take Bus No. 2 or 98 for Dadaepo at the bus stop in front of Busan Station. By Subway From Busan Station: Take Subway Line No. 1 to Sinpyeong Station or Goejeong Station. Then Transfer to Bus 2, 11, 96, or 98 to Dadaepo Beach.